August 17, 2018 VadaTech, Inc.
Henderson, NV – August 16, 2018 – VadaTech, a leading manufacturer of integrated systems, embedded boards, enabling software and application-ready platforms, announces the AMC585. 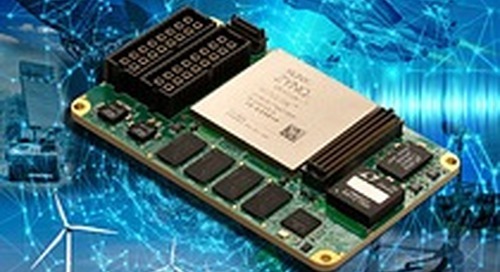 The AMC585 is an AMC FPGA Carrier with single FMC+ (VITA-57.4) interfaces. The AMC is compliant to AMC.1, AMC.2 and AMC.4 specifications. The unit has an on-board, re-configurable FPGA which interfaces directly to the AMC FCLKA, TCLKA-D, FMC DP0-23 and all FMC+ LA/HA/HB pairs (the module does not support HSPCe connector). The AMC585 is based on Xilinx UltraScale+ XCZU19EG MPSoC FPGA. The FPGA has 1968 DSP Slices and 1143k logic cells. The XCZU19EG includes quadcore ARM application processor, dual-core ARM real-time processor and Mali™ graphics processing unit, as well as over 34.6Mb of block RAM and 36 Mb of UltraRAM. The FPGA has an interface to a single DDR4 memory channel (64-bit wide with ECC to the ARM CPU). In addition there is 64GB of DDR-4 memory channel that connects to the FPGA. This allows for large buffer sizes to be stored during processing as well as for queuing the data to the host. The module has on board 64 GB of Flash, 128 MB of boot flash and an SD Card as an option. meet the most complex customer requirements. VadaTech also offers specialized product solutions for VME, CompactPCI, and other architectures. A member of PICMG and VITA, VadaTech has headquarters, design and manufacturing facilities in Henderson, NV with design, support and sales offices in Europe and Asia Pacific.